Travel back in time and experience the Roman Empire for yourself! If you are drawn to the polytheistic period of Greece, these adult costumes are perfect for you. Romans and Greeks were enamored by poets, philosophers, warriors, Emperors, Gods, and Goddesses! These people are still talked about today, even in modern times. We’ve all heard the stories of Mount Olympus and Zeus with his mighty lightning bolt. Now, Halloween fans can go back in time and live the lives of favored characters for just one evening! How amazing is that? 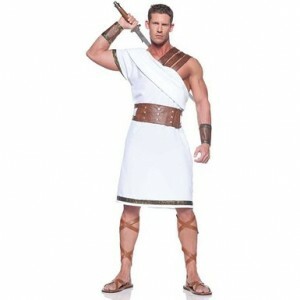 Our men’s Greek and Roman Costumes come in many sizes, shapes, colors. There are also varieties you would never have thought existed too. You can choose to look like Caesar, a gladiator, or a Roman senator too. Don’t forget you can always wear the classic toga, be a Spartan warrior or even dress up like a character from Clash of the Titans. If you really want to go bold—be Thor! These unique couples’ costumes will have you the center of the party, and they’re perfect for any kind of dress up event. Once again, from Hercules to King Neptune himself, on to a mighty Spartan gladiator, you choose what makes you feel larger than life! Going to a Frat party? Then this is the ideal costume idea. Complete your look and make it more authentic by adding accessories such as warrior sandals, swords, shields, and many other items—perhaps a toga! Select your Greek and Roman costumes today before they run out and become nothing more than mythology!